You had to know I was going to write about this one. It was a personal distance record for me…by more than 2 miles! But, I knew as soon as I posted, “Wooohooo, I did it,” on facebook that it was a lie. I didn’t do it, God gets all the glory on this run, just as He does all the others. To be honest, I had been looking for reasons, to call off my attempt at a shadow run of the Army 10 Miler. Topping my list of excuses was that I hadn’t run more than 4 miles in the last two weeks, and that was mostly just to see if I could even still put one foot in front of the other last Wednesday. Between travelling to Virginia with the boys for a wedding and attempting to play soccer with a bunch of 6 year olds, I haven’t been taking the best care of myself. I even had a friend who cautioned me to not be so ambitious that I would hurt myself. Not to mention the fact that I completely skipped the 9 mile training run. My husband was in the field and couldn’t run with me like I had originally hoped. When my babysitter couldn’t come that morning, I thought I was free and clear with legitimate reasons to bail. But then, a sweet friend offered to watch to boys, and I just knew that I couldn’t skip out on the run. I have blogged about how God has been supporting me through this running adventure. What statement would it make about my faith in Him, if I didn’t even try? I didn’t want to give any critics or skeptics fuel for their arguments, but I still wasn’t feeling very confident. Sunday morning, that lack of confidence turned into downright discouragement. The boys were sleeping when I got up to prepare for the race and it was quiet it the house. I thought I’d call my sister to wish her luck in D.C., and while talking to her I realized she was caught up in all the pre-race hype. She had 30,099 other people running with her, including her husband. They had people lining the route and cheering them on. They had the monuments! And water points, and a finish line with a post-race snack. All I had was my husband’s ratty old t-shirt from when he ran in the Army 10 miler a decade ago and a whole lot of hilly road ahead of me. I was having my very own full-blown pity party! I did find a little encouragement in the words of my reading from the first chapter of 2 Kings. Elijah showed the power of God in some awesome displays of defense against the king’s men who were after him. I wrote in my journal a little bit about the difference between self-confidence and God-Confidence, but that is another posting all-together. After praying for God to help me with the run, I felt pretty sure He was in my corner and that He had blessed me with some food for thought for the long run ahead. My motivation was low and the first mile was rough. I felt like I was just full of creaks and cracks, and couldn’t find my rhythm or breath. I continued bemoaning the fact that I was all alone, and even found myself trying to figure out how I could still bring glory to God if my run ended up a failure. While I wholeheartedly believe in the value of Training Partners, I think it is important to realize that the people and things of this world cannot take the place of God in our lives. I place a lot of responsibility upon my family and friends for supporting me. The run on Sunday was no different… I wanted the support of the world as I ran on Sunday and I was sad that I didn’t have it. God needed to teach me a lesson and when it finally sunk in around mile 4.5, I probably looked like a complete crazy woman running alone along a mostly deserted road early on a Sunday morning laughing out loud. Even unto the ends of the earth there is no place we can hide from God. He is with us always. Once I reached this epiphany, miles 5 and 6 were great. So good, in fact, that when I realized my turn around point was actually 5.2 out, I was OK with doing the extra .4 miles! Mile 7 started to get a little bit more painful and I was dreading 8 through 10. But, God is faithful to give us what we need, when we need it and this was a perfect example of it. I received an encouraging text from a friend and another surprised me just before the 8.5 mark to run the last two miles with me. So, *I* didn’t do it at all. God used my Army 10.4 Miler to prove, once again, how faithful He is to support me. First, through revelations from His word and then by the acts of those He brings into my life. Even when it seems that all earthly things have failed us, God will never leave or forsake us! 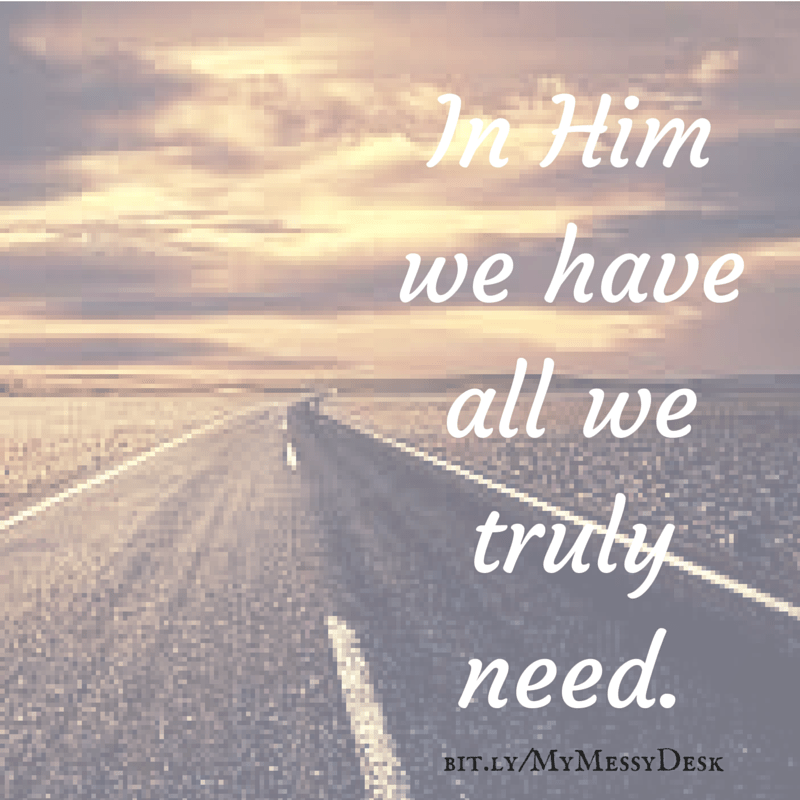 When we come to fully rely on Him alone for all our needs, we realize that in Him we have all we truly need! Rejoicing with you and giving God the glory! Welcome to My Messy Desk!I love crafting and encouraging women with the Word of God...and I'm so glad you're here. I hope you'll grab your favorite steamy beverage and visit for a while.